A wide variety of security solutions to protect your business. Whether for the public or business sector, including 3 Phase Industrial doors and shuttters, made to match your exact needs. Suitable for entrances to apartments, student accommodation blocks, retirement homes, high rise flats, offices and any shared access areas. 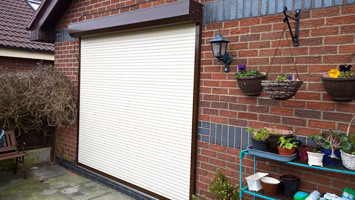 Domestic Security Shutters - combining easy operation with performance, a choice of insulated slats and colours which blend into your lifestyle and the look of your home. Hotels, restaurants, canteens and kiosks all have areas which need to restrict access or isolate an area when not in use and be quickly and efficiently securely locked up outside of opening hours. 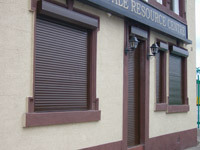 Are you a business or have property in the Saddleworth area looking to have economical security shutters installed? Our security shutters not only provide an excellent barrier against intruders but also deters vandalism. By installing a security shutter across a door or window it not only helps to deter and prevent a burglary from occurring, it also stops the damage caused by vandals breaking glass or damaging the door. 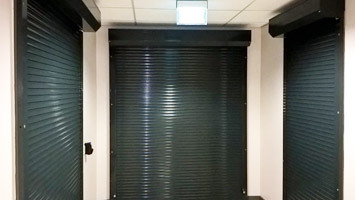 As a local company near Saddleworth we can survey, supply and install either manual or electric roller security shutters for home or business premises including internal bar servery, kiosks and counters. We can also install fire shutters in the Saddleworth area which provide a fire rating of up to 4 hours. All come with either with a standard 'mill' finish or a fully powder coated colour. You can view the range of colours here. Our security shutters can be installed with solid, perforated, punched or glazed facing (lath). For high security situations we can supply a range of Excel security roller shutter doors tested to conform to the police secured by design standards and those recommended by insurance companies. All our security shutters comply with the current Construction Product Directive and are fully CE Marked to comply with regulations that assure you of receiving a quality product. The type of installation you need will depend on your premises so our security shutters are made to measure to fit your exact opening. - All products are CE marked and compliant with the latest European product directives. - A selection of products tested to Loss Prevention Certification Board (LPCB) Level 1. - A choice of built-in and built-on products. 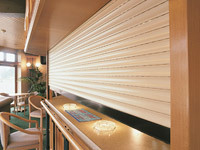 - Wide choice of colour and finishes including graphics to make your shutter unique. - Choice of operating functions both manual and electric. - A warranty to provide you with peace of mind. You can see the full range of features and benefits of our security shutters and grilles by downloading the SeceuroShield brochure. Roller shutter technology has advanced beyond traditional hard wired control and as part of our system design and installation we can provide the very latest Radio Technology Somfy (RTS) motors operated by wireless controls designed to simplify the installation process and ease of use. We can provide a roller shutter installation that requires no cables between the control points and motors, no need to channel cabling into walls and no exposed trunking. These can be operated by either single or multi channel remote controls- to control up to 4 shutters or as a group - or wall mounted switches. If you have an existing hard wired roller shutter that's not a problem, we can upgrade your exisitng installtion to use the RTS motors and controls. For more information download our Roller Shutter Guide - Radio Motors With Wireless Controls. If you are thinking about installing security shutters give our friendly staff a call to arrange a free survey and advise you on the best practical solution at the very best prices. 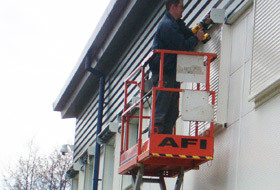 We can also carry out roller shutter maintenance or repairs to existing installations. With Dynamic Insulation™ from Somfy, roller shutters react automatically to climate variations to save energy and increase occupancy comfort during summer and winter months. In the summer a sun sensor on the property façade detects sunlight intensity and automatically lowers the roller shutters to an intermediate position – ideal for sun rooms and conservatories. When the sunlight fades, the shutters will automatically raise and await further commands from the user. In winter, when night falls, a timer control can be programmed to lower all roller shutters and improve window insulation. 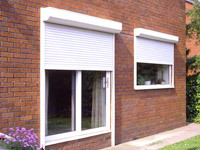 During the day, roller shutters remain up to take advantage of the heat from the sun. © Alliance Security Installations Ltd. All Rights Reserved. First for security roller shutters Saddleworth, security grilles and roller garage doors Manchester covering Rochdale, Oldham, Saddleworth, Bolton, Stockport, Wigan, Ashton, Trafford and Stretford, Middleton, Crumpsall, Blackley, Moston, Beswick, Collyhurst, Miles Platting, New Moston, Hulme, Rusholme, Saddleworth, Greenfield, Grotton, Urmston, Sale, Altrincham, Hale, Cheadle, Hazel Grove, Denton, Audenshaw, Hyde, Dukinfield, Stalybridge, Swinton, Prestwich, Whitefield, Radcliffe, Royton, Chadderton, Failsworth, Marple, Bredbury, Romiley, Littleborough, Wardle, Eccles, Irlam and Bramhall.